Just wanted to let you ladies know about an awesome study that Ms. Lois Van Dyke is hosting in her home starting Sept. 8th at 6:30 pm . 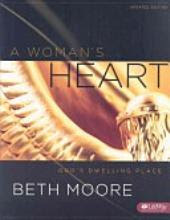 A Woman's Heart: God's Dwelling Place is a study by Beth Moore about the parallels of the Tabernacle's building and your life as a chosen vessel of God. We hope that you'll consider joining this study. Ms. Van Dyke has shared with us before and we gleamed so much from the wisdom that the Lord has given her. This will be a great opportunity if any of you are interested in doing a bible study. We look forward to seeing you at Emily's house on the 21st of September for our evening with Sheba Gil!